Cetaphil has been a fan favourite for a very long time. Even Dermatologists recommend this product to their patients. It is one of the most trustworthy brands in terms of skincare. I've always wanted to try Cetaphil products ever since I stumbled upon Cetaphil Dam Daily Advance Ultra Hydrating Lotion (Sadly, I could not review the same as my pet Dora destroyed the product one fine day). 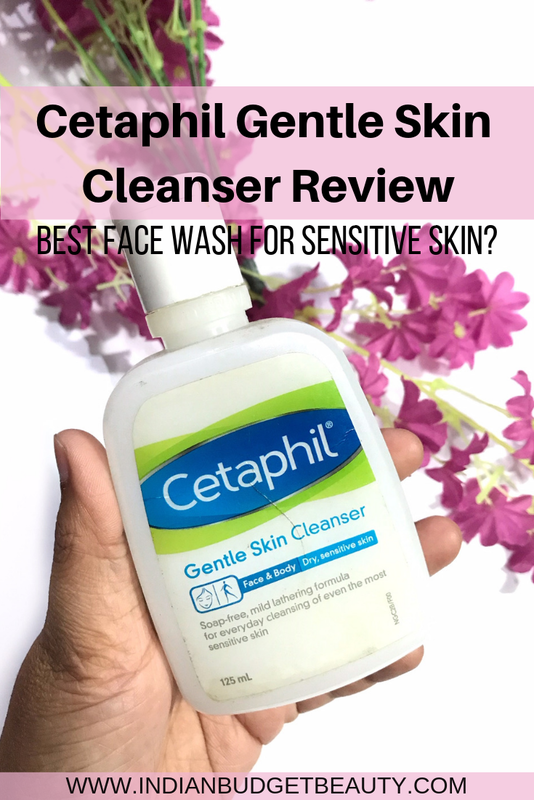 Cetaphil Gentle Skin Cleanser has been listed as one of the best Face Wash for sensitive skin as it is non-comedogenic and maintains your skin pH. It is a non-irritating and soothing cleanser both for skin and body which is fragrance-free as well. Cetyl Alcohol: is used as a thickening agent in the manufacture of creams and shampoos. Propylene Glycol: is used to prevent dry, rough, flaky skin and also used as a moisturizer. Sodium Lauryl Sulphate: is a synthetic detergent which is used to create bubbles. It comes in a simple white plastic packaging, which is very basic and simple. The 125ml bottle does not contain a pump, whereas the other variants do contain a pump so that you can control the amount of product you want. This cleanser has a white milky consistency which has micro shimmer particles if you look close enough. If you have dry skin or sensitive skin, then this product is totally a boon for you. I have a combination skin type, with an oily T zone and the rest of my face is quite dry. In this dry season, my face tends to get quite dry and flaky, which is not at all cute. So, whenever I try this face cleanser, it thus not make my face dry at all. Since it contains Propylene Glycol, it leaves your skin well moisturized without making it oily. This cleanser removes the dirt and grime from your face but will not remove your makeup totally if you are wearing any. I love the fact that it is not harsh on the skin at all, and not only can it be used for your face but also can be used on your body as well. It is a foaming cleanser and soothes the skin. Since it has non-comedogenic properties, people with oily skin and acne prone skin can totally use it without causing any breakout. But, if you have super oily skin, I don't feel that it will clean your skin thoroughly. I'd highly recommend this to those who have sensitive skin or are suffering from dry-flaky skin. Does Cetaphil Gentle Cleanser Clear Up Acne? A month ago, I was have facing some breakout on my chest area. It turned out, I was having those red chest acne. I've used this cleanser on the acne part daily to see if it really works. It did not completely eliminate my acne, but it did reduce the redness and size of the acne. Different ways of using Cetaphil Gentle Cleanser? You can basically use it as a face wash with water like all normal face cleanser. I even use it along with my Piany eyebrow razor to shape my brows. It works wonders with it. So, it can be used as an alternative to shaving gel. You can use it without water. Simply take a coin size amount of it and rub it on your face until it gets absorbed in, then wipe off using any facial wipes or baby wipes. Soothes the skin and moisturizes as well. Can be used as an alternative to shaving gel. Reduces the size of acne and redness. Has a non-irritating and fragrance-free formula. Cannot be used to deep cleanse your face.